1) Pre-cache all of the programs for improved speed. This means it will take a long time to load first time, but much faster on subsequent times. iPlayerMCE has now been renamed TunerFree MCE. With the inclusion of ITV and Channel 4 programs, the iPlayer name was no longer really appropriate, since it did so much more than BBC iPlayer. Since this program is allowing you to watch TV without having to use your tuner, I decided to rename it TunerFree MCE. It still provides full access to the BBC iPlayer through Vista Media Centre, but also allows ITV and Channel 4 watch again programming too! 1. When I try to watch Channel 4 programs, it doesn’t play the program. Try to play through internet explorer first, at http://www.channel4.com/watch_online. That may download new DRM software required by Channel 4, and may open new firewall ports required by Windows Media Player. Once the video plays fine through internet explorer, it will play fine through windows media center. 2. When I try to watch BBC programs, it doesn’t play the program. Try to play through internet explorer first, at http://www.bbc.co.uk/iplayer. That may download a new version of Flash. Once the video plays fine through internet explorer, it will play fine through windows media center. If you are playing the wmv files, you may need a DRM update which you can get by visiting this site in Internet Explorer. 3. When I try to watch ITV programs, it doesn’t play the program.? Try to play through internet explorer first, at http://www.itv.com/CatchUp. That may download new DRM software required by ITV. Once the video plays fine through internet explorer, it will play fine through windows media center. 4. When I try to watch Five programs, it doesn’t play the program.? Sometimes Five just displays “Buffering” for a long time. Add “five.tv” to your Sites under Privacy as described in FAQ 20b. 5. How do I play BBC Flash programs in full screen? Wait 10 seconds, and it will jump in to full screen automatically. If you exit full screen, click on the Full Screen button to go back in to full screen. The same applies to Hulu, Five and Channel 4. 6. How do I exit full screen from BBC Flash programs? Press the Stop button on your remote. The same applies to Hulu, Five and Channel 4. 7. Why don’t the BBC Flash, Channel 4, Five or Hulu programs play on my extender? For BBC you can select “Play BBC as WMV” in the settings, and then it will then play on the extender. 8. Does this work with 64 bit? Yes, the software will detect if you have a 64 bit system and set up the links accordingly. 9. What happened to iPlayerMCE? I renamed it to TunerFreeMCE. Since the code now covers far more than the BBC iPlayer, I thought that this was more appropriate. The minimum requirements are 2GB of RAM. if you don’t have that, you may see this problem. Secondly, make sure you have .NET 3.5 installed. Finally, sometimes this happens first time in. Press back and try again. 11. Can I set any options? Yes, there is a preferences screen in the top right hand corner. 12. How often should the background cache process run? Out of the box it runs hourly. This enables it to give a fairly accurate stamp of when BBC programs first appeared for searching by date. You could reduce it to daily if you wanted without significant loss of functionality, but any less and the dates would be wrong. You change the frequency in the Scheduled Tasks manager. Not applicable from version 2.0.2 onwards, which automatically runs as a service every 12 hours. In Media Center, go to settings. If you do get an error, try deleting your cache from C:\Program Data\MillieSoft\TunerFreeMCE\programList.dat and regenerating by running C:\Program Files\MillieSoft\TunerFreeMCE\TunerFreeMCECacheBuilder.exe. If the error still occurs, let us know at martin@milliesoft.co.uk. 14. Is there an XP Media Center version? 2) I don’t have a version on Visual Studio that can compile .NET 1.1, which is required for XP MCE. If there is anyone out there who wants to build an XP version, go for it – I can assure you there is plenty of demand. The source code is on sourceforge, so all you really need to do is build an html front end. I’d also add that while Vista gets a lot of stick, Media Center is one area where it really is a great improvement over XP. Upgrade – you won’t regret it. On the left hand side, we have the desktop running at 1080p and media center running at 720p. The blue area is the part of the screen in which the flash video will NOT be displayed – i.e. the flash video will be constrained to about a quarter of the screen. On the right hand side we see the desktop running at 720p and media center running at 1080p. The blue area is the part of the screen where the flash video is not visible – i.e. the flash video will extend beyond the screen boundaries and only about a quarter of the video will be visible. 16. Why don’t you do Sky Anytime too? 1) it needs a password, which makes it much harder. 3) it needs a sky subscription (which I don’t have) or buy programs individually. That makes it costly for me to develop. 4) On Windows 7 there is now a really cool Sky integration that uses interfaces that Microsoft don’t make available to regular developers, so I could never compete with that anyway. 17. What if I can’t install at C:\Program Files\MillieSoft\TunerFreeMCE? There was an issue in earlier versions that meant that you had to install to the C drive. You can now install to any drive. 2) run C:\Program Files\MillieSoft\TunerFreeMCE\TunerFreeMCECacheBuilder.exe, and make sure you don’t do it with administrator privileges. 19. Why doesn’t Hulu or ITV go full screen straight away? The way full screen for Hulu and ITV works is I simulate a mouse click on the full screen button 30 seconds after I open the page. I wait 30 seconds because it can take a long time to load. 20. I get a guidance warning. What do I do? b) On BBC, Channel 4, Five and Hulu, you can register and log in using the mouse and keyboard to stop further messages. This only works in Media Center if you change your IE privacy preferences to explicitly add each site to the list of Privacy Sites, so add bbc.co.uk, channel4.com, five.tv and hulu.com to the list of sites by going to Tools-> Internet Options -> Privacy -> Sites, entering the site name and press Allow. Then when you register and log in, it will remember you. 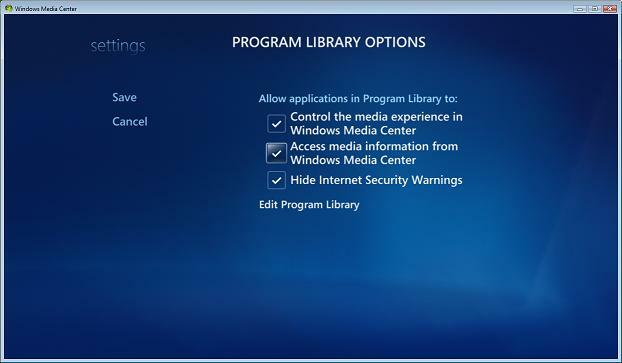 You may get asked to unblock firewall acces for media center after doing that (ehexthost.exe), which you should allow. 21. Why don’t I see the BBC HD Channel? BBC have a Sky and Virgin BBC HD channel, and a page for it on iPlayer too. That content is actually duplicated content from other channels like BBC One though, and doesn’t have any unique content of it’s own. Unlike platforms like Sky, TunerFreeMCE can access both HD and SD content for each channel, so rather than artificially grouping content by the resolution, we put it all under it’s original channel, and play the best possible quality available each time. HD content is indicated with an HD logo on the thumbnail. If you don’t want the high definition streams, you can change the preferences to default to standard definition. This uses about half the bandwidth, so can be a good idea for slower network connections. If you have problems updating the DRM definitions, go to C:\ProgramData\Microsoft\Windows\DRM and rename this to DRMbackup. then try the DRM update webpage again. This folder is hidden so you need to change the view options to show protected OS files first. 25. How do I see full error messages? 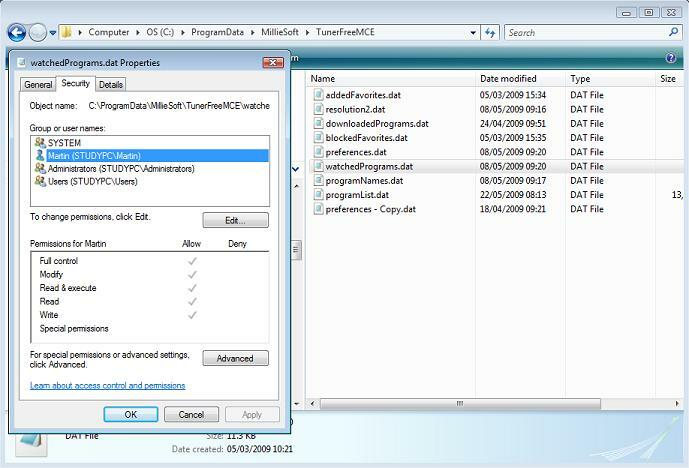 On Windows 7, open up Control Panel -> Administrative Tools -> Event Viewer, and then open the folder Applications and Services Logs -> Media Center. All exceptions are logged in there. Cut and paste that and post it to the forum. Edit C:/ProgramData/MillieSoft/TunerFreeMCE/preferences.dat in a text editor and find the entry for logFile. Add a file name, e.g.